If you love First Person Shooter (FPS) Games but don't have the cash to shell out for those high end ones that put a whole in your pocket then you might want to hurry up and go to BundleStars.com and grab their freebie. Yeah, I know it's kind of hard to believe but they're actually giving away this great indie game Vivisector. Oh, and if you think you can make your own FPS Game you can also go ahead and grab the FPS Creator on the same page. This is just the first few things BundleStars.com will be giving away and as far as I know they're goal is to give you great digital games at very low prices. Don't believe me? Just go ahead and read the PR after the break and the source link where you can get all the goodies. November 22nd, 2012: Bundle Stars, a new website announced today, is giving thousands of PC gamers the chance to download not one, but two free PC games. Vivisector: Beast Within, from 1C Games, is a frenzied first-person shooter set on a covert military installation where experimental human-animal hybrid soldiers roam wild. Players are pitted against the bizarre and unpredictable beasts of Soreo Isle over sixteen huge levels in this gory, wildly unique FPS. 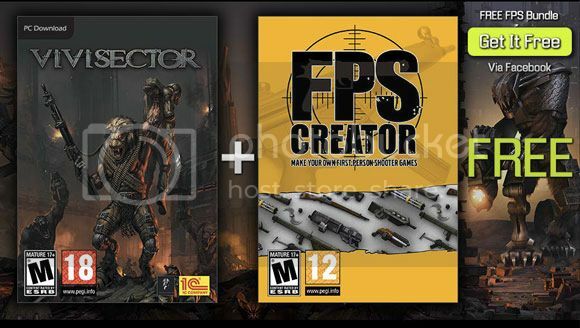 Gamers also have the chance to let their own imaginations run wild with FPS Creator, a game creation tool that allows users to build their own high quality first-person shooter games. Easy to use and with amazing end game results, FPS Creator lets users create their games instantly with its intuitive 3D editor - then play them at the click of a button. Gamers can drag and drop walls, doors, enemies, weapons and more as they explore what it’s like to be an indie developer – but with no programming knowledge required. Gamers can download the free bundle, which has a total value of $70, by visiting www.facebook.com/bundlestars. The offer ends on November 26th. The double game giveaway serves as a taster for what’s coming soon from Bundle Stars. Starting late November, the website will offer a new bundle of premium quality PC games every month at a massively discounted price. To find out more, visit www.bundlestars.com. Bundle Stars is a new website that offers spectacular collections of digital games for pocket money prices, saving gamers up to 95% off the retail price. Bundle Stars is owned and operated by Focus Multimedia Ltd, one of the UK’s leading independent computer games and software publishers. Since 1995, Focus has been working closely with talented developers and global game brands, including Angry Birds® Star Wars®, Mystery Case Files® and Assassin’s Creed™. Focus is currently seeking new publishing and development partners, and high-traffic affiliates. For more information please visit www.bundlestars.com.